Every one of my patients becomes a case study to me. I got a late start in this field and sought out some of our greatest barefoot researchers and pioneers to learn how to actually heal hooves. I document with accurate photos and charts to make every horse, pony and donkey in my practice as healthy and sound as possible. 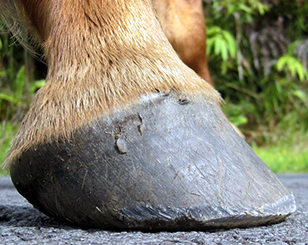 I have finally found the solutions for preventing and treating laminitis/founder as well as arthritic disease and concussion-related fractures: natural hooves and a species-specific diet. 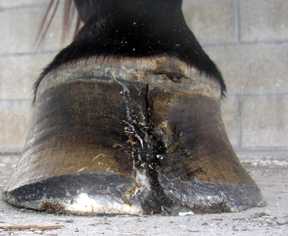 I have learned that it's never too late to try barefoot rehabilitation for anything that ails a horse because their hooves are living organs that are essential to the health of all the systems of the horse from the circulatory to the skeletal, muscular, nervous and digestive. I have been Micki's only trimmer since she was a weanling, eight years ago. She lives in horrible 1 acre pasture almost up to her knees in mud around sharp, lava rocks but she does have a rubber-matted, dry pen where she stands to her diet of alfalfa hay. I started out by barely kissing her baby hooves with the soft side of my rasp on a 4 week schedule, then 6 weeks, then 8 and today her hooves have become self-maintaining to the point I only trim her twice a year! 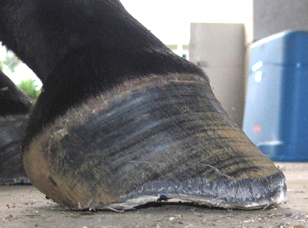 You can see the perfect angle of her RF hoof as well as how scratched up it is from scraping rocks. Micki was the first of many colts and fillies in my practice who are proving that barefoot is the right option even in the most hostile place on earth for horses! 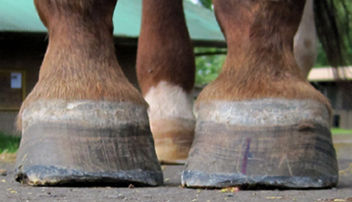 It is NOT possible to "correct" anatomy by raising medial heels and toes in order to make a pigeon-toed horse toe-out or visa versa. 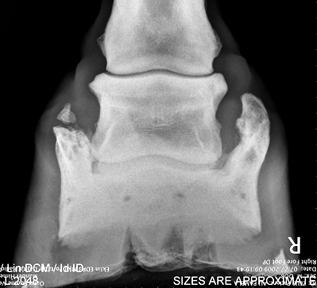 By outward appearance it might look good for a while until the horse develops arthritic deposits (as seen in the following x-ray) and the hooves remodel in order to compensate for the improper shape of the capsule. 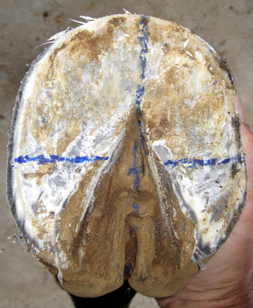 By mapping the solar surface and following a physiological trim we find the point of articulation or center of balance in every hoof. 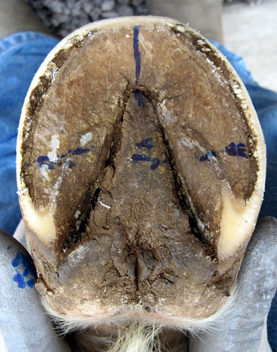 From there we need to determine the true flight path of the hoof in order to allow it to breakover as it would if the horse wore it down from traveling 20+ miles a day on rocky terrain. When the horse is walking, observe movement from the poll and follow it through the neck, withers, down the shoulders through the joints to the ground for each foot. 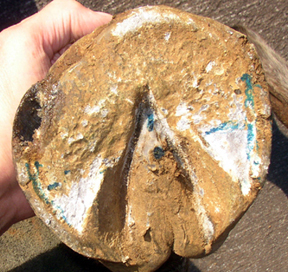 If the horse swings a foot out instead of rolling over the toe, then the alignment is off. Stand behind the horse and watch the bottom of the hooves when walking away and determine the direction that each frog points just before hitting the ground. This is the key to the true flight path to determine the placement of breakover. Extend the frog line up the dorsal wall and you'll get the exact visual reference. The following photo is a perfect example of a horse who has NOT been allowed to toe-in during a lifetime of ranch work in shoes. 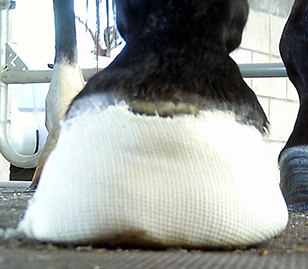 Between her front feet you can see the RR swollen pastern from a systemic thrush infection. When trimming, I exaggerate the breakover for the true flight path which will allow the capsule to realign with its coffin bone and, over time, will restore circulation and proper foot function. I have been trimming many horses since they were foals and none have developed a "grazing" or "club" foot. On the other hand, virtually all the new, mature horses I treat have developed one front foot that is more upright from predominantly grazing with that foot beneath their body. 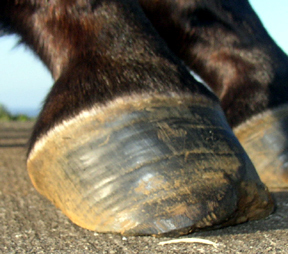 Most humans are right-handed and so, too, most horses are right-footed, meaning their RR hoof is their healthiest; the RR is will be poised beneath their body, ready to launch them into flight - it's a defensive habit of foraging prey animals. Anything short of 6,000 acres is too small a pasture for horses to naturally roam and forage for food. When we put them into confinement, they stand in one place for periods at a time with their best rear foot forward and the corresponding front foot back, creating unnatural growth pattern resulting in the "grazing" foot. This can be prevented by frequent physiological trims from three weeks of age. I'd never seen a "grazing" foot as bad as Cindy's RF and tried to keep a vision in my mind of how I wanted it to turn out through the coming years of remodeling. The solar surface was flat and round as a pancake with a major cavity in the toe that eventually cracked up through the front into the coronary band causing numerous abscessing episodes. I began to lower the heels, followed the true flight path for the breakover and watched the capsule realign with the coffin bone. The healing process was hell for her during the abscessing episodes but we supported her with bute and antibiotics when infections went systemic. At one point, I cast the hoof for four months to stabilize it while it reattached correctly at the coronary band and healthy new growth finally began to appear. Diet has been an huge issue for this horse because she is living on a field where sugar cane was growing until a few decades ago! The grasses are high in sugars and the soil is still toxic from all the unregulated pesticides, herbicides and fertilizers = a no-win situation. To help balance her digestion, Cindy's getting apple cider vinegar daily (see my Guide To Safely Feeding Horses In Hawaii). The solar shape of Cindy's RF hoof changed dramatically from circular to oval, her hoof walls became thicker with fewer separations, her heels expanded, and her frogs are growing better after suffering from raging thrush. At this point in her rehabilitation, I happily turned Cindy's trimming over to her owner and she's doing a great job!